A parliamentary group from Germany from The Left Party in the Bundestag have expressed solidarity with ” Youth Against the Settlements” group in Hebron, amid the attacks by the Israeli occupation forces and settlers on their center. We, Dieter Dehm, Heike Hänsel, Christine Buchholz, Birke Bull Bischoff, Achim Kessler, Zaklin Nastic, Jessica Tatti, Tobias Pflüger and Niema Movassat, are dismayed by the attacks of Israeli right-wing settlers on the premises of the Palestinian group”Youth against Settlements” in the West Bank town of Hebron last week. Several members of the group were injured. We have visited the premises of the “Youth against Settlements” group at the beginning of December 2018. We were warmly welcomed by Issa Amro and his fellow activists. 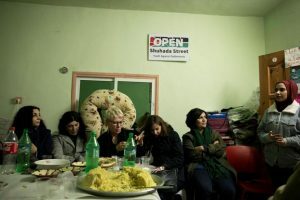 They informed us about their youth activities and about their non-violent actions against the occupation. The activists reported about the constant attacks of right-wing Israeli settlers, who do not face any kind of criminal prosecution. We would like to wish the injured activists a speedy recovery and we call upon Israeli law enforcement authorities to hold accountable those who are responsible for these attacks. The existing impunity towards Israeli settlers in the West Bank, particularly in Hebron, must come to an end.